Zion National Park is my favorite of Utah's "Mighty Five". It is also the first and most visited. It is host to...in my humble opinion...3 of the 10 best day hikes America has to offer. We will cover Observation Point and Angels Landing in future posts but today I give you the wildest, and perhaps most dangerous, of the three...The Narrows. The Narrows is the narrowest section of Zion Canyon...so it's not just a clever name! When did I do it? I hiked the Narrows on a day with my buddy Greg in August of 2015. How far did we go? We reached about a half mile past Orderville Canyon and hiked into that side Canyon. All in all we did about 7 miles RT. Where does the hike start? Temple of Sinawava shuttle stop, the first half mile or so is paved leading up to the Narrows section, you will come in on the Zion Canyon Shuttle. Do you have to hike in the water? Yes, it is what makes this hike so unique, so unforgettable, and ultimately so dangerous due to flash floods. Many have died tragically on this trek. Always TRIPLE check flash flood levels with Zion on their current conditions. They are also good with updating these on FB and Twitter. What should I bring? Closed toed and waterproof shoes! Hiking poles (I have a great pair from REI.) I would have fallen 10 times without my poles. Also bring a waterproof device for your photo gear, water (it is still a workout even though you are in water), and the usuals like sunscreen, sunglasses, Larabars, etc. Oh yeah...a sense of calm as you adventure into the unknown! I am a crazy SOB, can I do more than a day hike? Yep! You can secure a backcountry wilderness permit and hike all the way down and spend the night. More deets HERE! Oderville Canyon...almost time to turn back! Where should I stay in Zion? The Zion Lodge, tent camping like a boss, or Springdale Utah! When should I do go? Obviously only after checking the flash flood levels, but typically your best bet is summer/fall. I was there in May and the river level wasn't even close! What's your favorite story from the hike? When Greg and I were wrapping up this German guy came walking through in bare feet (somehow he had made it about a half mile already), no hiking poles, and opened a can of Budweiser at 10am and said to me "When in Rome!" Hahaha! Go on this hike. But be safe AND smart and only go if conditions are overwhelmingly in your favor to return in one piece. It is one of my favorites and I can't wait to do it again. You WILL get wet...you MIGHT get SOAKED! 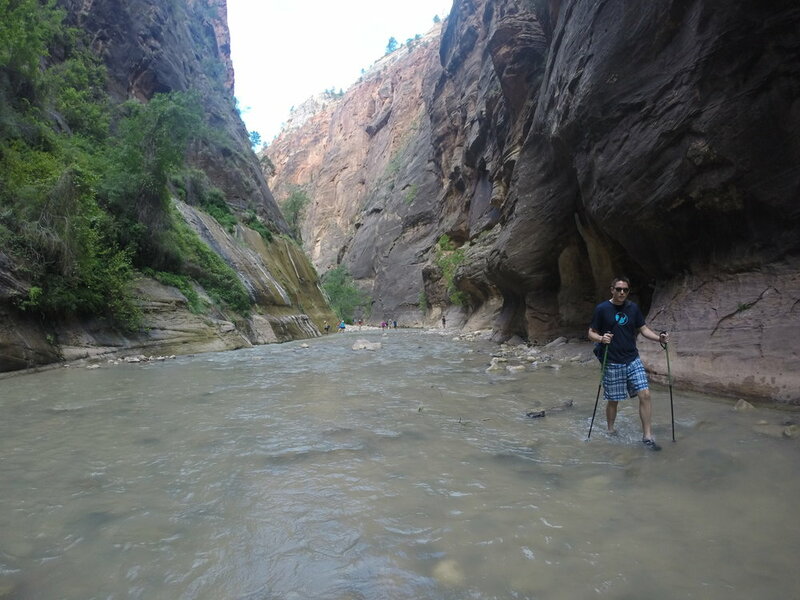 Have you hiked the Narrows? Comments below and let's discuss!